Italy - Aegean Islands: Individual Islands Overprints on the 1930 Ferrucci Issue (the four lower values; the 5 Lira values are not present). A handsome presentation made by the Mystic Stamp Company, probably back in the 1940s or perhaps 1950s, with a nice write-up and the stamps attractively presented. All Mint Hinged, with centering that appears to range from F-VF to VF. 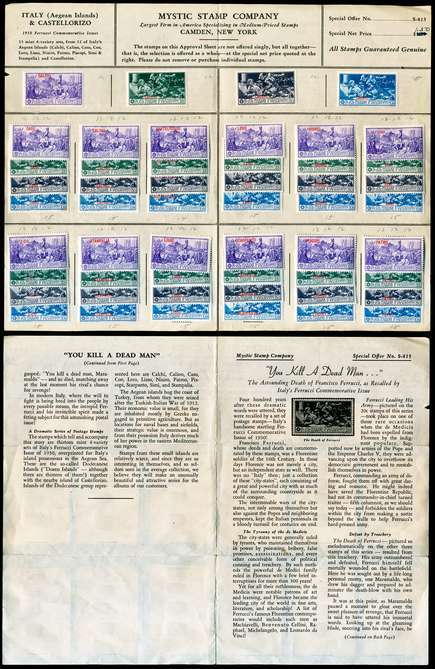 Despite the text of the presentation, a total of 14 overprinted sets were issued, not 13. For reasons only known to Mystic, the set from the island of Rhodes ("Rodi") is not included in this presentation. Present, EXCEPT Rhodes ("Rodi"), are all 12 of the Aegean Islands listed, following Italy, under the individual Aegean Islands, PLUS Castellorizo which Scott lists separately, alphabetically. The islands are: Calchi, Calino, Caso, Coo, Lero, Lisso, Nisiro, Patmo, Piscopi, Scarpanto (omitted from the text of the presentation in one place), Simi, and Stampalia [what a great name], and then Castellorizo. These broadly represent the Dodecanese Islands, or Dozen Islands. Even though the 5 Lira high values are not present, these stamps have significant total catalog value (Scott 2018 totals $238) and they are missing from most worldwide collections. Like some stamps that are scarcer today, these were inexpensive when originally offered... at an original price of $1.25 which was hand-changed to $1.50! Whenever I have any of this individual stamps in stock, they sell quickly. I have never had a nice large group like this -- and the presentation is a bonus!